Opera is one of the oldest forms of artistic expression and has changed very little throughout the centuries. Though it remains one of the few constants in the world of fine art, there are several innovators who are evolving the craft while keeping its tradition alive. 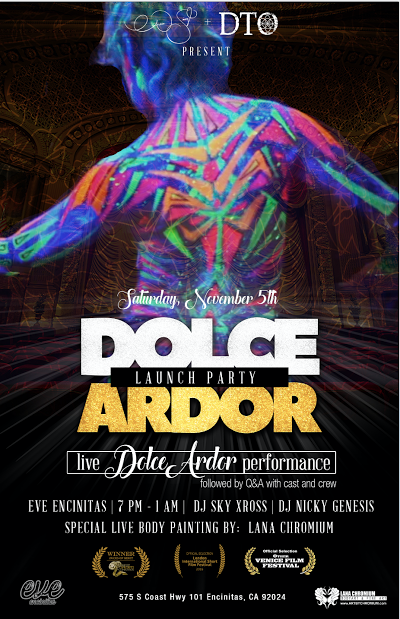 "Dolce Ardor," which translates to sweet fervor in Italian, is a multi-sensory experience combining the elegance of 18th century classical music with the modern psychedlia of blacklights, trip-hop and electronica. While this sounds like an unlikely pairing, creators Andrea Saenz (singer, lead actor, producer, director) and Dave "DTO" Kemp (artist, music producer) have elegantly balanced an aria composed by Alexander Gluck in 1770 with Kemp's modern electronic music production. Together they meticulously curated this multimedia artform with a solid cast and crew that includes Matthew Jackson (co-director, producer), John Hafner (director of photography), Lana Chromium (makeup artist, body painter), Casey McDonald (costume designer) and Tara Alexis (editor) with guest guitarist John Ziegler. The result is an unfolding narrative paired with captivating visuals that won the Award of Merit for the Best Shorts Competition and was officially selected by the London International Short Film Festival and Music Video Competition for Other Venice Film Festival. Just in the beginning of its journey, "Dolce Ardor" is an evocative story of discovery, passion, disintegration, rebirth and freedom. The voice and face of "Dolce Ardor" is Andrea Saenz who has been classically trained since the age of 16. She is now based out of Los Angeles where she has taken up acting, dancing, and singing, a trifecta reminiscent of Hollywood's golden age. Kemp is also a classically trained musician having started piano lessons at age five and discovering composition at age ten. Throughout high school and college he played in concert and orchestral groups, continually honing in on his skills as a musician. While both Saenz and Kemp are lovers of all things classical, they also desire to evolve these crafts into something that is as innovative as it is traditional. Saenz and Kemp combined minds in the recording studio and after hours of collaboration, "Dolce Ardor" was conceived. It began as a song melding Saenz's voice with Kemp's production and a few months later evolved into "Dolce Ardor: An Electronic Opera Music Video." Opera has always been equal parts aural and visual so it was only natural that "Dolce Ardor" progressed in that direction. What they have created is a beautiful anachronism that resurrects the enduring art of opera while appealing to a modern audience with the physical potency of electronic music. 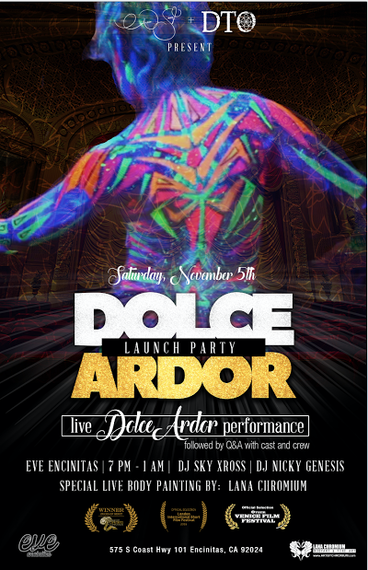 "Dolce Ardor" will be hosting two premiere parties for their video in San Diego on November 5th and in Los Angeles on December 3rd. There will be a live "Dolce Ardor" show, live body painting by Lana Chromium, and a special Q&A with the cast and crew after the performance. Electrifying and divine, "Dolce Ardor" is an inter-dimensional exploration into the elegance of the 18th century, the evolution of music, and the psychedelic journey. This team of creative masterminds and musical architects are reshaping classical music with their intoxicating, and truly one-of-a-kind, "trip-hopera."